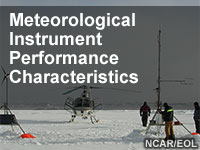 This advanced lesson explores the performance characteristics of instrumentation used for meteorological measurements. Static performance characteristics are examined in the context of calibration, which offers a means to determine an instrument's response. Dynamic performance characteristics, including first and second order inputs, are discussed using three classic examples: step or impulse, ramp or time varying, and oscillatory inputs. The lesson provides information about the effects of representativeness and regional homogeneity on measurements, and also describes processes for obtaining quantitative estimates of uncertainty. Notes: Requires user login with free registration. For non-commercial use. This report describes and documents the benefits that the Air Transport Industry (ATI) gains from increased forecast accuracy achieved through the daily collection of atmospheric data gathered by approximately 4,000 inflight commercial aircraft. The report also outlines the Aircraft Meteorological DAta Relay (AMDAR) observing system, the forecast process and describes the importance that AMDAR data plays in numerical weather prediction (NWP). Measuring the benefits to the ATI requires first to describe and to quantify the improved weather forecast accuracies due solely to the assimilation of the AMDAR data into NWP and its availability to meteorologists. The effects and impacts of the resulting improved forecasts are categorized according to their characteristics (linear1, threshold, etc.) and in relation with each operational activity performed by each ATI sector and function. For the airlines, we can clearly quantify the benefits of more accurate wind forecasts especially on the fuel burn calculation and fuel load made prior to flight. The impacts during flights and for the other operational activities are more difficult to model. Statistical data for each operational decision derived from better forecast accuracy would be needed to make such assessments. These ‘relational’ statistics are less likely to be documented and much more complex to evaluate. Indeed complex weather phenomena (like convective storms, icing, fog, etc.) are the primary disruptive sources to ATI operations and their prediction certainly is improved with the availability of AMDAR data. However, we are able to leverage a modeling method which relates the Weather Impact Traffic Index (WITI) and the Forecast Accuracy Index (WITI-FA) to calculate an economic impact accounting for the significant role that AMDAR plays in increasing weather forecast accuracy. For other operational activities and aspects of the ATI, there is considerable and well-justified subjective evidence and testimony of the positive impact and value of AMDAR data. The report therefore provides strong quantitative and ample qualitative evidence of significant benefits and costs savings to be gained from ATI support and participation in the WMO AMDAR Program. This report reviews the impact of AMDAR observations on operational NWP forecasts at both regional and global scales that support national and local weather forecast offices across the globe. A 4-page brochure, developed and published by WMO, that briefly explains the benefits of the AMDAR observing system to airlines and the aviation industry. 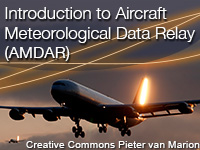 Introduction to Aircraft Meteorological Data Relay (AMDAR) provides national meteorological services worldwide, airlines, and aviation organizations with information about the World Meteorological Organization (WMO) aircraft-based observing system. The audience includes meteorological service managers and providers, observational development groups, the aviation industry, and others interested in benefiting from an aircraft-based observing system in their region. The content includes interviews with several experts to provide examples of AMDAR use for both meteorological and aviation applications. Additional details about the systems and requirements for implementing AMDAR are also included. The main purpose of this guide is to provide practical information on the development, organization, implementation and operation of the Global Observing System in order to enhance both the participation of individual Members in the System and the benefits they may obtain from it. The Guide explains and describes Global Observing System practices, procedures and specifications and is aimed at assisting the technical and administrative staff of National Meteorological Services responsible for the networks of observing stations in preparing national instructions for observers.